The Isotoner Open Finger Therapeutic Gloves provide fast relief from symptoms caused by conditions such as arthritis or edema. They are ideal for those who need extra support in their hands after surgery or for people who experience pain or aching after performing a repetitive motion. Created by a certified hand specialist, these therapeutic gloves for arthritis are made of latex free materials. The seams are placed on the outside of the gloves to avoid any unnecessary agitation of already sensitive hands. They open finger design allows the fingers to move freely so you can carry on with your daily routine. They provide 23-32 mmHg of smooth, even pressure that gently massages the users hands to relieve swelling and aches. They are water repellent and can be worn during the day or comfortably during sleep. The gloves come as a pair and are extra small in size. Dimensions: 9.45" x 0.59" x 3.19"
The Isotoner Open Finger Therapeutic Gloves provide fast relief from symptoms caused by conditions such as arthritis or edema. They are ideal for those who need extra support in their hands after surgery or for people who experience pain or aching after performing a repetitive motion. Created by a certified hand specialist, these therapeutic gloves for arthritis are made of latex free materials. The seams are placed on the outside of the gloves to avoid any unnecessary agitation of already sensitive hands. They open finger design allows the fingers to move freely so you can carry on with your daily routine. They provide 23-32 mmHg of smooth, even pressure that gently massages the users hands to relieve swelling and aches. They are water repellent and can be worn during the day or comfortably during sleep. The gloves come as a pair and are small in size. The Isotoner Open Finger Therapeutic Gloves provide fast relief from symptoms caused by conditions such as arthritis or edema. They are ideal for those who need extra support in their hands after surgery or for people who experience pain or aching after performing a repetitive motion. Created by a certified hand specialist, these therapeutic gloves for arthritis are made of latex free materials. The seams are placed on the outside of the gloves to avoid any unnecessary agitation of already sensitive hands. They open finger design allows the fingers to move freely so you can carry on with your daily routine. They provide 23-32 mmHg of smooth, even pressure that gently massages the users hands to relieve swelling and aches. They are water repellent and can be worn during the day or comfortably during sleep. The gloves come as a pair and are medium in size. The Isotoner Open Finger Therapeutic Gloves provide fast relief from symptoms caused by conditions such as arthritis or edema. They are ideal for those who need extra support in their hands after surgery or for people who experience pain or aching after performing a repetitive motion. Created by a certified hand specialist, these therapeutic gloves for arthritis are made of latex free materials. The seams are placed on the outside of the gloves to avoid any unnecessary agitation of already sensitive hands. They open finger design allows the fingers to move freely so you can carry on with your daily routine. They provide 23-32 mmHg of smooth, even pressure that gently massages the users hands to relieve swelling and aches. They are water repellent and can be worn during the day or comfortably during sleep. The gloves come as a pair and are large in size. The Isotoner Full Finger Therapeutic Gloves provide fast relief from symptoms caused by conditions such as arthritis or edema. They are ideal for those who need extra support in their hands after surgery or for people who experience pain or aching after performing a repetitive motion. Created by a certified hand specialist, these therapeutic gloves for arthritis are made of latex free materials. The seams are placed on the outside of the gloves to avoid any unnecessary agitation of already sensitive hands. The open finger design allows the fingers to move freely so you can carry on with your daily routine. They open finger design allows the fingers to move freely so you can carry on with your daily routine. They provide 23-32 mmHg of smooth, even pressure that gently massages the users hands to relieve swelling and aches. They are water repellent and can be worn during the day or comfortably during sleep. The gloves come as a pair and are extra small in size. The Isotoner Full Finger Therapeutic Gloves provide fast relief from symptoms caused by conditions such as arthritis or edema. They are ideal for those who need extra support in their hands after surgery or for people who experience pain or aching after performing a repetitive motion. Created by a certified hand specialist, these therapeutic gloves for arthritis are made of latex free materials. The seams are placed on the outside of the gloves to avoid any unnecessary agitation of already sensitive hands. The open finger design allows the fingers to move freely so you can carry on with your daily routine. They open finger design allows the fingers to move freely so you can carry on with your daily routine. They provide 23-32 mmHg of smooth, even pressure that gently massages the users hands to relieve swelling and aches. They are water repellent and can be worn during the day or comfortably during sleep. The gloves come as a pair and are small in size. The Isotoner Full Finger Therapeutic Gloves provide fast relief from symptoms caused by conditions such as arthritis or edema. They are ideal for those who need extra support in their hands after surgery or for people who experience pain or aching after performing a repetitive motion. Created by a certified hand specialist, these therapeutic gloves for arthritis are made of latex free materials. The seams are placed on the outside of the gloves to avoid any unnecessary agitation of already sensitive hands. The open finger design allows the fingers to move freely so you can carry on with your daily routine. They open finger design allows the fingers to move freely so you can carry on with your daily routine. They provide 23-32 mmHg of smooth, even pressure that gently massages the users hands to relieve swelling and aches. They are water repellent and can be worn during the day or comfortably during sleep. The gloves come as a pair and are medium in size. The Isotoner Full Finger Therapeutic Gloves provide fast relief from symptoms caused by conditions such as arthritis or edema. They are ideal for those who need extra support in their hands after surgery or for people who experience pain or aching after performing a repetitive motion. Created by a certified hand specialist, these therapeutic gloves for arthritis are made of latex free materials. The seams are placed on the outside of the gloves to avoid any unnecessary agitation of already sensitive hands. The open finger design allows the fingers to move freely so you can carry on with your daily routine. They open finger design allows the fingers to move freely so you can carry on with your daily routine. They provide 23-32 mmHg of smooth, even pressure that gently massages the users hands to relieve swelling and aches. They are water repellent and can be worn during the day or comfortably during sleep. The gloves come as a pair and are large in size. Hatch Edema Glove is a full-finger, over-the-wrist length that provide gentle compression to help control edema. The glove features gentle, soft tissue compression to help reduce swelling to minimize hypertrophic scarring from burns and other traumatic injuries. It is made of medical grade soft compression Lycra® sewn with outside seams for increased comfort. The latex-free material is comfortable, able to be worn for as long as needed. With an improved design and Gunn-cut style, the glove is economical and offers a better fit to provide users with the best experience possible. One glove included for the right hand in size extra-small. Hatch Edema Glove is a full-finger, over-the-wrist length that provide gentle compression to help control edema. The glove features gentle, soft tissue compression to help reduce swelling to minimize hypertrophic scarring from burns and other traumatic injuries. It is made of medical grade soft compression Lycra® sewn with outside seams for increased comfort. The latex-free material is comfortable, able to be worn for as long as needed. With an improved design and Gunn-cut style, the glove is economical and offers a better fit to provide users with the best experience possible. One glove included for the right hand in size small. Hatch Edema Glove is a full-finger, over-the-wrist length that provide gentle compression to help control edema. The glove features gentle, soft tissue compression to help reduce swelling to minimize hypertrophic scarring from burns and other traumatic injuries. It is made of medical grade soft compression Lycra® sewn with outside seams for increased comfort. The latex-free material is comfortable, able to be worn for as long as needed. With an improved design and Gunn-cut style, the glove is economical and offers a better fit to provide users with the best experience possible. One glove included for the right hand in size medium. Dimensions: 4" x 2" x 8"
Hatch Edema Glove is a full-finger, over-the-wrist length that provide gentle compression to help control edema. The glove features gentle, soft tissue compression to help reduce swelling to minimize hypertrophic scarring from burns and other traumatic injuries. It is made of medical grade soft compression Lycra® sewn with outside seams for increased comfort. The latex-free material is comfortable, able to be worn for as long as needed. With an improved design and Gunn-cut style, the glove is economical and offers a better fit to provide users with the best experience possible. One glove included for the right hand in size large. 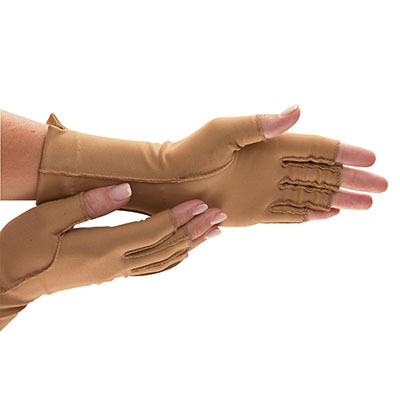 Hatch Edema Glove is a full-finger, over-the-wrist length that provide gentle compression to help control edema. The glove features gentle, soft tissue compression to help reduce swelling to minimize hypertrophic scarring from burns and other traumatic injuries. It is made of medical grade soft compression Lycra® sewn with outside seams for increased comfort. The latex-free material is comfortable, able to be worn for as long as needed. With an improved design and Gunn-cut style, the glove is economical and offers a better fit to provide users with the best experience possible. One glove included for the left hand in size extra-small. Dimensions: 4" x 2" x 9"
Hatch Edema Glove is a full-finger, over-the-wrist length that provide gentle compression to help control edema. The glove features gentle, soft tissue compression to help reduce swelling to minimize hypertrophic scarring from burns and other traumatic injuries. It is made of medical grade soft compression Lycra® sewn with outside seams for increased comfort. The latex-free material is comfortable, able to be worn for as long as needed. With an improved design and Gunn-cut style, the glove is economical and offers a better fit to provide users with the best experience possible. One glove included for the left hand in size small. Hatch Edema Glove is a full-finger, over-the-wrist length that provide gentle compression to help control edema. The glove features gentle, soft tissue compression to help reduce swelling to minimize hypertrophic scarring from burns and other traumatic injuries. It is made of medical grade soft compression Lycra® sewn with outside seams for increased comfort. The latex-free material is comfortable, able to be worn for as long as needed. With an improved design and Gunn-cut style, the glove is economical and offers a better fit to provide users with the best experience possible. One glove included for the left hand in size medium. Dimensions: 4" x 2" x 10"
Hatch Edema Glove is a full-finger, over-the-wrist length that provide gentle compression to help control edema. The glove features gentle, soft tissue compression to help reduce swelling to minimize hypertrophic scarring from burns and other traumatic injuries. It is made of medical grade soft compression Lycra® sewn with outside seams for increased comfort. The latex-free material is comfortable, able to be worn for as long as needed. With an improved design and Gunn-cut style, the glove is economical and offers a better fit to provide users with the best experience possible. One glove included for the left hand in size large. Hatch Edema Glove is an open-finger, over-the-wrist length that provide gentle compression to help control edema. The glove features gentle, soft tissue compression to help reduce swelling to minimize hypertrophic scarring from burns and other traumatic injuries. It is made of medical grade soft compression Lycra® sewn with outside seams for increased comfort. The latex-free material is comfortable, able to be worn for as long as needed. With an improved design and Gunn-cut style, the glove is economical and offers a better fit to provide users with the best experience possible. One glove included for the right hand in size extra-small. Hatch Edema Glove is an open-finger, over-the-wrist length that provide gentle compression to help control edema. The glove features gentle, soft tissue compression to help reduce swelling to minimize hypertrophic scarring from burns and other traumatic injuries. It is made of medical grade soft compression Lycra® sewn with outside seams for increased comfort. The latex-free material is comfortable, able to be worn for as long as needed. With an improved design and Gunn-cut style, the glove is economical and offers a better fit to provide users with the best experience possible. One glove included for the right hand in size small. 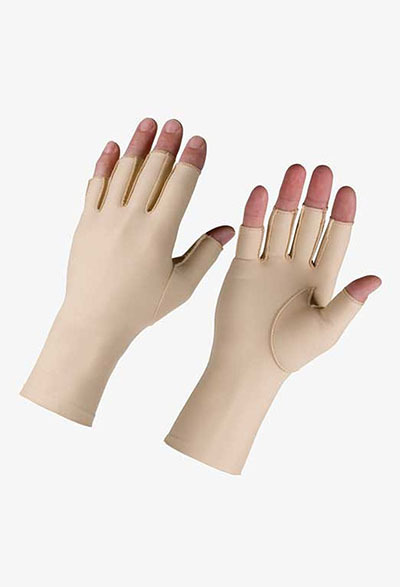 Hatch Edema Glove is an open-finger, over-the-wrist length that provide gentle compression to help control edema. The glove features gentle, soft tissue compression to help reduce swelling to minimize hypertrophic scarring from burns and other traumatic injuries. It is made of medical grade soft compression Lycra® sewn with outside seams for increased comfort. The latex-free material is comfortable, able to be worn for as long as needed. With an improved design and Gunn-cut style, the glove is economical and offers a better fit to provide users with the best experience possible. One glove included for the right hand in size medium. 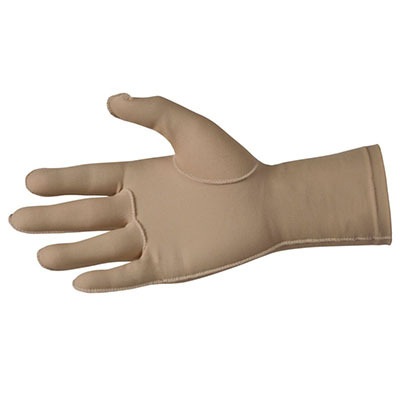 Hatch Edema Glove is an open-finger, over-the-wrist length that provide gentle compression to help control edema. The glove features gentle, soft tissue compression to help reduce swelling to minimize hypertrophic scarring from burns and other traumatic injuries. It is made of medical grade soft compression Lycra® sewn with outside seams for increased comfort. The latex-free material is comfortable, able to be worn for as long as needed. With an improved design and Gunn-cut style, the glove is economical and offers a better fit to provide users with the best experience possible. One glove included for the right hand in size large. 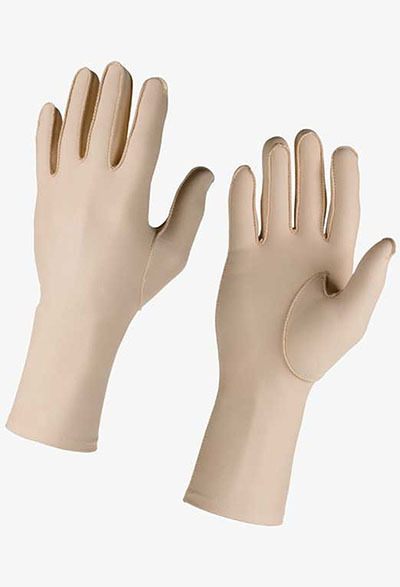 Hatch Edema Glove is an open-finger, over-the-wrist length that provide gentle compression to help control edema. The glove features gentle, soft tissue compression to help reduce swelling to minimize hypertrophic scarring from burns and other traumatic injuries. It is made of medical grade soft compression Lycra® sewn with outside seams for increased comfort. The latex-free material is comfortable, able to be worn for as long as needed. With an improved design and Gunn-cut style, the glove is economical and offers a better fit to provide users with the best experience possible. One glove included for the left hand in size extra-small. Hatch Edema Glove is an open-finger, over-the-wrist length that provide gentle compression to help control edema. The glove features gentle, soft tissue compression to help reduce swelling to minimize hypertrophic scarring from burns and other traumatic injuries. It is made of medical grade soft compression Lycra® sewn with outside seams for increased comfort. The latex-free material is comfortable, able to be worn for as long as needed. With an improved design and Gunn-cut style, the glove is economical and offers a better fit to provide users with the best experience possible. One glove included for the left hand in size small. 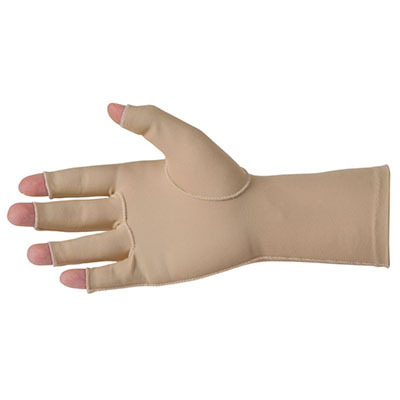 Hatch Edema Glove is an open-finger, over-the-wrist length that provide gentle compression to help control edema. The glove features gentle, soft tissue compression to help reduce swelling to minimize hypertrophic scarring from burns and other traumatic injuries. It is made of medical grade soft compression Lycra® sewn with outside seams for increased comfort. The latex-free material is comfortable, able to be worn for as long as needed. With an improved design and Gunn-cut style, the glove is economical and offers a better fit to provide users with the best experience possible. One glove included for the left hand in size medium. 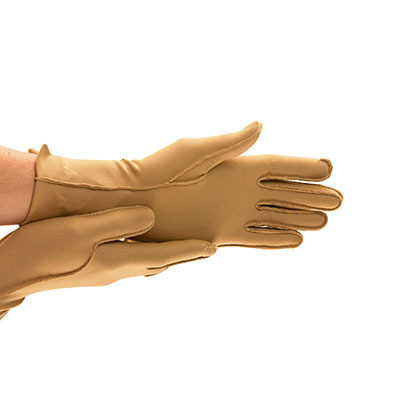 Hatch Edema Glove is an open-finger, over-the-wrist length that provide gentle compression to help control edema. The glove features gentle, soft tissue compression to help reduce swelling to minimize hypertrophic scarring from burns and other traumatic injuries. It is made of medical grade soft compression Lycra® sewn with outside seams for increased comfort. The latex-free material is comfortable, able to be worn for as long as needed. With an improved design and Gunn-cut style, the glove is economical and offers a better fit to provide users with the best experience possible. One glove included for the left hand in size large.